The cruise terminal pre-boarding lounge opens at 10:30AM. All passengers should arrive at the time indicated on their sailing documents posted by their cruise line. Due to security restrictions, only ticketed passengers will be allowed in the terminal building. ALL sailing passengers must arrive at least 90 minutes prior to the ship’s scheduled departure time. Late arriving passengers will be denied entry to the terminal and will not be allowed to sail on their cruise. Upon arrival to the terminal building have your approved Travel and identification documents as per your cruise line’s instructions. It is highly recommended that all sailing passengers complete their Online Pre-Registration with the cruise line at least 5 days prior to sailing. Passengers, who do not pre-register online, may be subject to longer wait times in the check in / pre-boarding process. All pre-approved day visitors entering the terminal will be required to present official government photo ID upon entry of the terminal building. All minors must be escorted by a parent or guardian. Personal Alcohol is limited to wine and champagne (two 75mL bottles per stateroom). All other forms of alcohol are prohibited. Our shipboard bars and restaurants offer a wide variety of beer and spirits and are available to all guests 21 and older.older. Non-alcoholic beverage may be brought on board via carry on only. Guests are limited to 12 standard 17 Oz cans, bottles or cartons per stateroom. Confiscated alcohol will be stored on the ship and returned on the final day of sailing. All alcohol, in open containers, will not be returned and will be discarded. Alcohol consumption is strictly prohibited on Cape Liberty Cruise Port Premises. All items, vehicles and persons will be subject to security screening. The following items are prohibited by the terminal: firearms, ammunition, imitation or replica weapons, explosives or explosive component parts such as detonators, fireworks or pyrotechnics, knives , taser (electronic stun guns), pepper or mace sprays, telescopic or regular batons, handcuffs, flammable or explosive liquids, undocumented service animals, aerial drones, hover boards, clothing irons, extension cords and Samsung Galaxy Note7. For all other prohibited items, please check with your cruise line. Terminal security will confiscate any prohibited items as deemed by the cruise line. All passengers s have the option to self-carry their luggage onboard. Elevators inside the terminal must be used for passengers with excess luggage. No luggage carts are available in the terminal. Any luggage that does not fit through the terminal screening machine will have to be checked through the porter delivery service. Maximum dimension for self-carry luggage is 23" x 16". Please have all luggage properly tagged prior to arrival to the terminal as per your cruise line’s insructions. Luggage drop off zones 1-5 are located directly in front of the terminal. Passengers and their luggage should be dropped off at the same zone. The terminal entrance is adjacent to all luggage drop off zones. REMINDER: Take all valuables, medication and travel documents with you in your personal hand carry luggage. Cape Liberty Cruise Port LLC takes no responsibility for lost, stolen or damaged items while luggage is in the custody of porter service. All baggage, checked or personal hand carry, will be inspected and must be attended to at all times. When inside the terminal, you will be assisted by directional staff. Be prepared for security clearance and documentation checks. Have all necessary travel documents ready for verification. Passengers will be permitted to disembark the vessel once all US Customs and Border Protection (CBP) clearance and arrival services are complete. Disembarking passengers should have their customs declaration form completed and identification ready to be presented to CBP officials. Express walk-off is available upon clearance of the vessel. No Porter service is available for passengers participating in express walk-off and all passengers must be able to carry their own luggage from their stateroom to their planned method of transportation. Luggage will be brought to the terminal from the ship prior to passenger disembarkation and laid out according to the cruise line’s tag system. Porter service is available to assist with luggage retrieval and transfer to your planned method of transportation. Large pieces of luggage are not permitted on the terminal’s escalator. Elevators are available for those passengers with large pieces of luggage. REMINDER: Take all valuables, medication and travel documents with you in your personal hand carry luggage. Cape Liberty Cruise Port LLC takes no responsibility for lost, stolen or damaged items while luggage is in custody of porter service. Passengers must remain onboard until ship personnel give notification and clearance that luggage is ready for retrieval. Items that were confiscated can be retrieved directly after CBP inspection area and before exiting the facility. The passenger is responsible to present their confiscated item voucher in order to retrieve their property. Items that are not retrieved on the day of disembarkation may be arranged for pick-up, within 2 weeks, by calling 201-436-2083. Disembarking passengers will have the option for bus transfer, taxi transfer or personal pick-ups after exiting the CBP inspection facility. Directional staff and signage will assist in getting passengers to the correct area based on travel needs. Pick-up Zones 6 – 10 are clearly marked along the main building and are designated pick up areas for passengers who have pre-arranged their own transportation by car service, friend or family. Zones A, B, C, D are designated for pre-arranged hotel shuttle service. Pre-purchased bus transfers are located in the bus lot directly across the street from exiting CBP. Taxi stand is located across the street from Zone 10. There is a cell phone waiting lot located adjacent to terminal. Standing and/or parking in front of the main terminal is strictly prohibited. Vehicles and vehicle owners violating that restriction are subject to tow, fine and/or arrest. On the day of disembarkation please contact Intercruises Shore Side and Port Services, 201-436-2088, to make arrangements to retrieve lost luggage. For retrieval after the ship sails, please call the terminal office 201-436-2083 for further assistance. Passengers with special accessibility needs should contact their cruise line for further assistance and information. A safe and secure parking facility is conveniently located adjacent to the cruise terminal. Parking fees are $22 per day including all taxes.Cash and major credit cards are accepted. No reservations are necessary and parking is guaranteed. Oversized vehicles, such as campers and RV’s, that occupy more than one space, will be charged double the normal rate. The height restriction of the garage is 7’ 4”. 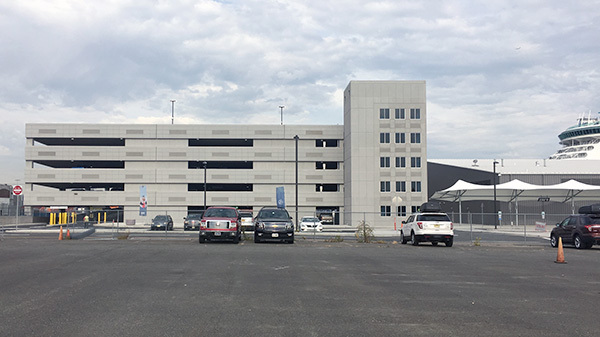 There is an open lot adjacent to the parking garage to accommodate vehicles with height restrictions. Cape Liberty Cruise Port, LLC is not affiliated with any off-site parking facilities. Transfer service via coach shuttle can be purchased for pre and post cruise arrangements. Purchase of transfer tickets can be made through your travel agent, cruise line or directly onboard. Please check with your cruise line for further details. The coach shuttle pick-up area is located directly across from the terminal facility exit. Pick-up Zones A, B, C, D are clearly marked across from the main building and are designated pick up areas for Hotel shuttle service. Taxis are available in the designated taxi lot located across from zone 10. Taxi rates are available with the dispatcher at the taxi stand. to drive you to the cruise port, which is about two miles east of the Light Rail line. From the Port Authority Bus Terminal, take the 119 bus to Bayonne. The 119 bus travels along Kennedy Boulevard into Bayonne and stops on request every three blocks. When you reach 33rd Street and Kennedy Boulevard in Bayonne, you will be at the closest point on the bus route to the cruise port. 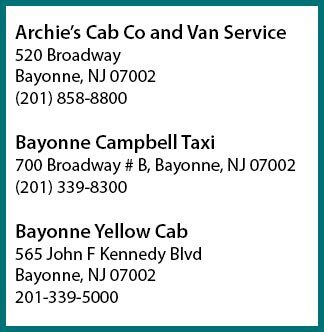 Call one of the three Bayonne cab companies ADD CAB LINK to drive you to the cruise port, which is about three miles east of Kennedy Boulevard. Use this address for way finding purposes: 4 Port Terminal Blvd, Bayonne, NJ 07002. Take the New Jersey Turnpike/I-95 South to Exit 14A - Bayonne. Take the New Jersey Turnpike/I-95 North to Exit 14A - Follow directions above from Exit 14A.Bayonne. Take I-78 East directly to Exit 14A- Bayonne. Follow directions above from Exit 14A. Take the Verrazano Narrows Bridge into Staten Island. Take I-278 West to Route 440 North over the Bayonne Bridge (Check for Bayonne Bridge Closures). Continue on Route 440 North approximately 3 miles. Make a right into the Bayonne Ocean Terminal. The cruise terminal is 2 miles straight ahead. Take the Lincoln Tunnel to New Jersey. Follow I-495 West to the New Jersey Turnpike/I-95 South. Take the turnpike south to Exit 14A - Bayonne. Follow directions above from Exit 14A. Take the Palisades Parkway South to I-80 West. Follow signs for the New JerseyTurnpike/I-95 South. Continue to Exit 14A Bayonne. Take the turnpike south to Exit 14A - Bayonne. Follow directions above from Exit 14A.